There are more homeless people in Los Angeles in 2015 than there have been since the homeless census in 2007. The biennial homeless count, released in mid-May, reported a 16% increase in the number of men, women and children living on the streets or in shelters. And the most notable change? A huge bump of 85% in the number of people living in tents, cars and recreational vehicles. My North Hollywood neighborhood is proof of this. 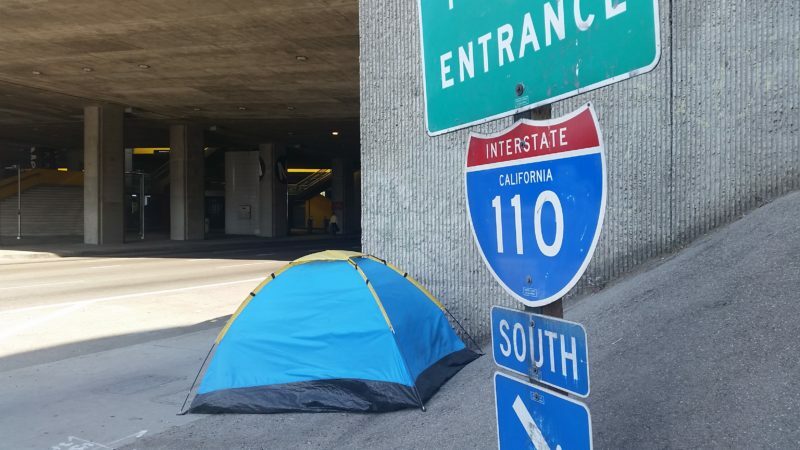 A virtual tent city has cropped up around the 170 freeway near Magnolia Blvd. Personally, I’ve noticed an uptick in panhandling around the freeway exits and the Metro stations, and I’ve been trying not to avert my eyes, but to really see the faces of people so down on their luck that they are asking strangers for money. They are mainly single adults, with a heart-breaking 20% of families with children. Collectively, they paint a picture of the life problems that can knock a person to the fringes of society: 20% are mentally ill, 17% have substance abuse problems, 15% are victims of domestic violence, 14% are physically disabled, 6% are veterans. Their stories are mere sketches of details. A disability or disease or mental illness that makes it impossible to work. A boyfriend who beat her and abandoned her in LA with no money and no way to get home. I get the sense listening to these stories that a gigantic iceberg looms underneath these simple details. For a problem as intractable as homelessness, is there ever one cause? So many problems have deep roots. So how does the city of Los Angeles respond to this uptick? Yesterday (June 16), the City Council gave preliminary approval to two ordinances designed to make it easier to break up homeless camps. The new ordinances would replace the current city practice that gives the homeless three days’ warning before seizing their belongings if they’re left on sidewalks or in parks. Now, homeless people will be given just 24 hours’ notice, and large personal items like tables and couches can be taken without warning. When I was younger, I used to dodge panhandlers in Westwood on my way to work. I never gave them money because I didn’t think they were really homeless. One of them had a car and drove to the same spot every day. He said once, in a moment of a candor to one of my co-workers, that he made more money panhandling than working. I don’t know if that was true. I’m less judgmental now. I don’t try to guess another person’s motivation behind asking for money or sleeping on the street. I think asking strangers for money must feel degrading and awful. If there are those who find it fun or love doing it, they are a tiny majority. I give them all the benefit of the doubt, a smile and some spare change. If it funds alcohol or drugs, then I hope it dulls the pain that day, and I hope they get further help. I wish we could find better long-term solutions. In the meantime, here are eight great organizations fighting on the front lines. Provides permanent supportive housing and a safe and healthy community fostering dignity, respect, and personal stability. On Los Angeles’ Skid Row, this 71-year-old Christian-based mission feeds hundreds of hungry people and provides assistance to impoverished individuals and families. Provides emergency services such as shelter, food, clothing, as well as professional medical and dental services from its Skid Row location. Christian-based. Also offers long-term residential rehabilitation programs including education, professional mental health counseling, job training/placement, and transitional housing. Provides emergency food, clothing, medical, vision and dental care, job skills training and job placement assistance, English as a Second Language classes, youth activities, and a Christmas program. In the San Fernando Valley. Provides emergency services like food and shelter, and addiction recovery, job training, education and work programs from Skid Row location. Founded in 1914. Offering services related to housing, domestic violence, physical health, mental health, life skills/wellness, income services and substance abuse in west Los Angeles. Offers 90 days of emergency shelter to families, traveling shower trucks and hot meals. Also operates three thrift stores, and is always taking donations of household items, baby stuff and clothes. A fire destroyed their emergency shelter in May 2014, and the newly built one in North Hollywood will open soon. One of the largest Christian-based missions in the nation and preparing to celebrate its 125-year anniversary in 2016. Offers emergency and long-term services to men, women and children from its Skid Row location. Learn more about the Los Angeles Homeless Services Authority and its biennial census.